Thirsty Pilgrim: The Books Come to Life and Dance with the Janitor When the Shop Closes at Night. The Books Come to Life and Dance with the Janitor When the Shop Closes at Night. Sitting on a farm in mid-Missouri, sipping coffee. Junior was hungry and it's damn early. Feeling strong and virile thanks to a steady diet of sunshine, lake time, red meat, and Boulevard beers. Also feeling like a salesman this morning. 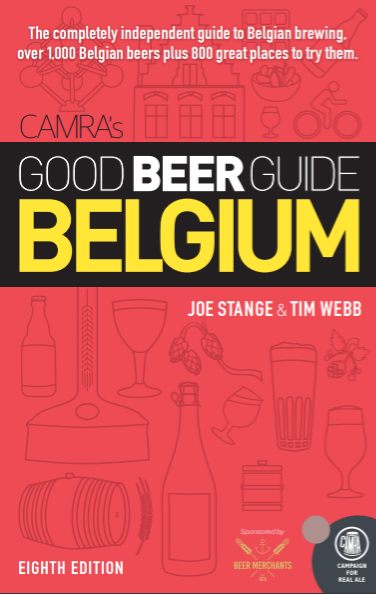 I'd hope that Thirsty Pilgrim readers are a saturated market when it comes to owning the handy little guidebook, Around Brussels in 80 Beers. But I know that you have friends. And they, obviously, want to know where to get a copy of their own. Since you're too cheap to give them one. Well, as you know, there's the instant mail order. Or if you're in Brussels there are a bunch of shops: Waterstones, Sterling Books, Filigraines, Bier Tempel, Beer Planet, Beermania, Delices et Caprices and a couple others. Still more to come. Waterstones especially—and perhaps against their better judgement—has seen some potential in us. 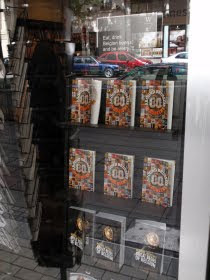 They bought a very large amount of books and put up a window promotion. Here you see the photographic evidence. Mr. Jackson's books are below ours, but we won't let that go to our heads. And I don't think he'll hold it against us.